I am a Punjabi and like every self respecting Punjabi I love my paranthas like I love no other item of food. Take the bread away from a Punjabi; take away the fancy Thai and Chinese food, but take away his paranthas and you will have him floundering like a fish out of water. That brings us to the stuffing ….. ohh the stuffing …. grated cauliflower or radish with ginger and fresh green chilies, potatoes, onion, methi, paneer, boiled peas, even left over dal; all this and more is put into paranthas and the end result is absolutely scrumptious! The type of Paranthas one can eat is mind boggling. Stuffed paranthas, soft and fluffy, served piping hot with dollops of homemade butter melting on them like white rivulets, layered paranthas with sprinklings of mint or ajwain, crisp and crunchy as autumn leaves, to be eaten with homemade tomato chutney or curd; or just plain paranthas fried in ghee till crisp, to be dipped in honey …. Ah Bliss! Most of us living outside Punjab have moved on to other forms of breakfast like cereal, bread or even idlis or poha, but in Punjab, Breakfast equals paranthas and if you try telling people otherwise they will look at you sympathetically and proclaim you quite mad. My aunt, a rotund lady who firmly believes in the goodness of Paranthas was advised by her doctor to give them up if she wanted to lose weight. Needless to say she was shocked as if the doctor had sounded her death knell. She gave the poor man a dressing down he will never forget and marched out. Paranthas have always been blamed as being high in calories and I suppose they are – if they are fried in Ghee or are eaten dripping Butter. But that is when they taste the best and what to do, we Punjabis love our Butter! Nowadays, we usually have the fat free version - paranthas stuffed with vegetables but not fried, they make a healthy wholesome meal. Homemade paranthas are the best, followed by the paranthas that one gets at the numerous Dhabas that line the Delhi – Chandigarh highway. Fancy shops in cities are really not able to capture the taste as well as these small dhabas. Paranthe waali gali in Chandani Chowk is much touted as serving the best paranthas but frankly I have come back disappointed from there! I hate cooking as a rule but paranthas is the only food item I can cook and I dare say, cook with some panache. I can do without a lot of things in my life but I don’t think I can ever do without paranthas. Paranthas are my comfort food, my brunch on lazy fog filled winter mornings, my wrap and carry with you travel food. If you want to please me, feed me paranthas and I will be yours for life! Now since this post has me drooling all over the keyboard, please excuse me while I go make myself some paranthas. Personally, I like my Paranthas with fresh cream. And yeah, the Paranthe Wali Galli is a big farce. I mean, those are not even Paranthas. More like puris served with pumpkin. @Arti - Yes, paranthas are aren't they ! @snowleopard - LOL on Puri served with pumpkin !You are right actually. I prefer mine with curd or honey. @Swaram - Any time, Any Time ! and and a bit of mint chutnee or just plain youghart ..
or or the famous red chilly and onion chutney , with butter mixed .. Loved the Ballad of the Paratha, only it was in prose. When I was a child, parantha's symbolized happiness for the family. Otherwise, we were just served chapatis. I say there is a grand conspiracy in works out there. How come the burgers, sandwitches and the chowmein are less deadly than poor paranthas? Why can't we have parantha-curd for the soul? I have been to southhall toooo ..
@zephyr - you are welcome anytime ! Besides Murthal there are a lot of other dhabas on the highway that serve these delectable circles ! @Umashankar - Parahathas for the soul - lovely idea! @Bikram - Murthal was always mindblowing ! I am sure you get good paranthas when you go to your village also ! Mouth watering post indeed !! 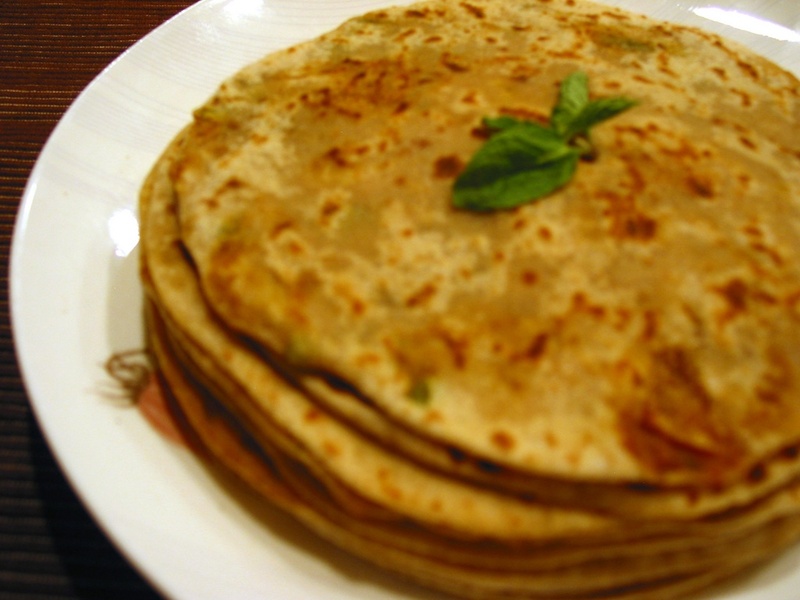 Paranthas are the only real treat and nothing to beat them as a holiday breakfast! I will have a gobhi parantha with carrot pickle please. :) Loved the post. I also prefer home-made and dhaaba wala paranthas to parathe wali gali paranthas. BTW you are right about the parantha galiwale paranthas. Nothing to write home about. A mouth watering post! I have to have pasanthas for lunch now! What a yummy post! You know everyone loves parathas. My mom always make gobhi, mooli, methi, aloo, chana dal, meetha and so many versions of paratha. I love them too. My favorite is gobhi :). There is something very comforting about parathas. I even like to do them in mustard oil. Gives a twist to taste. Of course have switched to the healthier versions but love it still a lot. Oh! Paranthas!! Our day does not start without a parantha! It is the only satisfying and the one that gives a filling feeling... poha/upma etc... are ok once in a while but they are more like a snack. Breakfast is synonymous with Paranthas. I love methi with mashed aloo the best. Dal paranthas are my fav too. Agree, no one can match the taste of a home-made paranthas. Home-made Parathas are the best. I don't get the fuss over Parathewali Gali either. I need to come to your place now. Sadly despite being a Delhite, I have yet to perfect the art of making paranthas. Blame my ghee phobia. And my favourite is gobhi parantha! U may kill me for this but I dont fancy paranthas . May be due to a horribel experience I had in lucknow where I got food poisoning after havng paranthas for 3 consecutive days. May be it was made with horrible oil . Not sure ! P.s. your cover pic is too good.im guessing its a memory from a journey.